Of the 38 million Americans coping with migraines in the United States, 28 million are adult women. That means 18% of adult women in the USA experience migraines. That is nearly one in five. 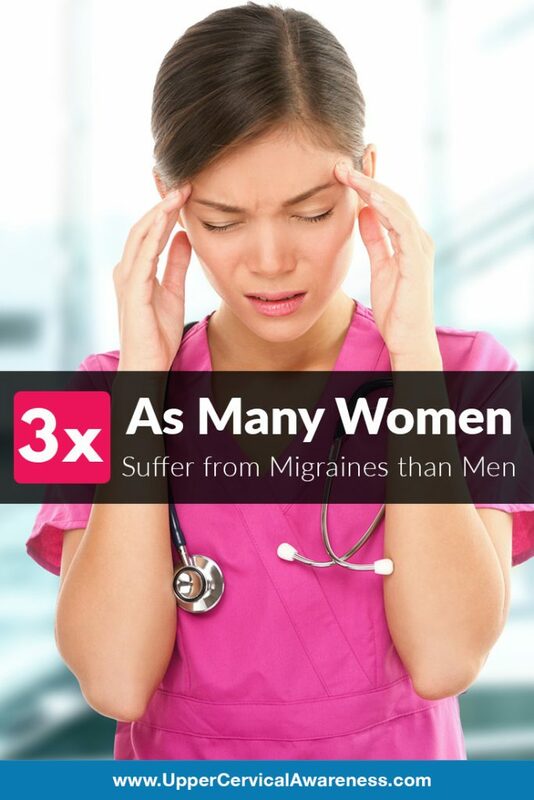 Half of these women experience more than one migraine per month and a quarter of them deal with four or more severe migraines each month. Why does the disparity exist? Why do migraines last longer for women, and why do females report more chronic pain than males? While the reason is not 100% understood, there are a few interesting facts that have a bearing. A female is most likely to have her first migraine during the year she has her first period than at any other point in her life. Migraines in women often increase between puberty and 40 years of age, and then they begin to decline. Many women find migraines increase during menstruation, pregnancy, and menopause. All of these factors contribute to the idea that female hormone levels affect the frequency and severity of migraines. Migraines are also affected by things such as blood flow to the brain and proper cerebrospinal fluid drainage. These factors are often related to the position of the top bones of the neck, the C1 and C2 vertebrae. When a subluxation exists in this part of the body, migraines are just one of the many potential symptoms. A misalignment can also affect the proper functioning of the brainstem. Because the hypothalamus (the part of the brain that controls hormones) receives many of its signals from the brainstem, anything that affects brainstem function can affect the proper release of hormones in the body. Therefore, even if migraines are hormone related, proper upper cervical alignment is vital. If you are experiencing migraines, especially if these migraines get worse during times of hormone fluctuations, an upper cervical misalignment may be an underlying factor. Scheduling a consultation with an upper cervical specialist may be your first step toward fewer and less severe attacks.